In-process and on-machine measurements are used to evaluate a variety of machining factors and conditions as well as the work done on the machine tool. 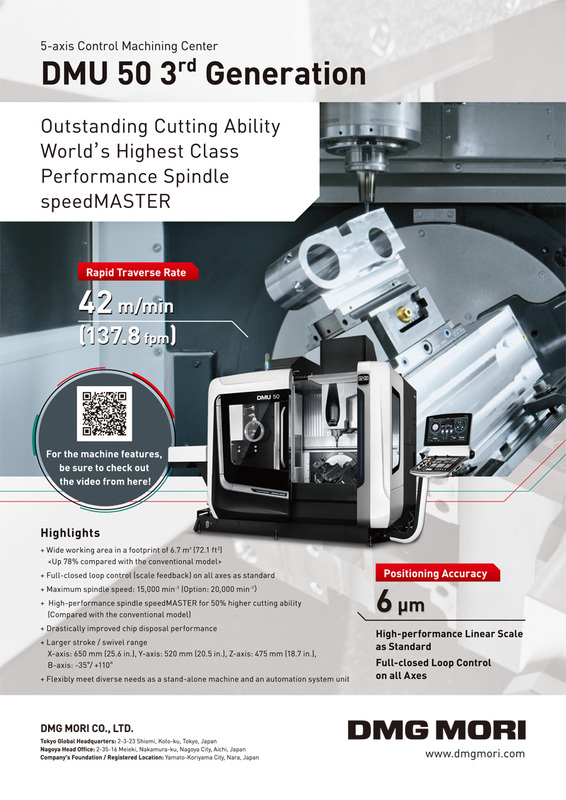 With the increasing complexity of machining processes and greater requirements for accuracy and precision, the demand for advanced methods for process optimization has also increased. To meet this demand, process quality management (QM) requires an expansion of manufacturing metrology to include comprehensive closed-loop control of the machining process. To eliminate the effects of disturbances on the machining process and adjust the control quantities to optimal values for robustness, in-process and on-machine measurements are very essential. In this paper, we review technical trends in in-process and on-machine measurements for process QM and conventional quality control (QC) of products. Spreading measurement targets and applications are comprehensively reviewed. Y. Takaya, “In-Process and On-Machine Measurement of Machining Accuracy for Process and Product Quality Management: A Review,” Int. J. Automation Technol., Vol.8, No.1, pp. 4-19, 2014. N. Taniguchi, “Current status in, and future trends of, ultraprecision machining and ultrafine materials processing,” Annals of CIRP, Vol.32, Issue 2, pp. 573-582, 1983. M. Shiraishi, “Scope of in-process measurement, monitoring, and control techniques in machining processes – Part 1: In-process techniques for tools,” Precision Engineering, Vol.10, No.4, pp. 179-189, 1988. M. Shiraishi, “Scope of in-process measurement, monitoring, and control techniques in machining processes – Part 2: In-process techniques for workpieces,” Precision Engineering, Vol.11, No.1, pp. 27-37, 1989. M. Shiraishi, “Scope of in-process measurement, monitoring, and control techniques in machining processes – Part 3: In-process techniques for cutting ptocesses and machine tools,” Precision Engineering, Vol.11, No.1, pp. 39-47, 1989. ISO 230-10, “Test code for machine tools – Part 10: Determination of the measuring performance of probing systems of numerically controlled machine tools,” 2011.
 International Organization for Standardization, “Guide to Expression of Uncertainty of Measurement,” JCGM 100, 2008. A. Weckenmann and M. Rinnagl, “Acceptance of processes: do we need decision rules?” Precision Engineering, Vol.24, pp. 264-269, 2000. T. Kohno, Y. Okazaki, N. Ozawa, K. Mitsui, and M. Omoda, “Inprocess measurement and a workpiece-referred form accuracy control system (WORFAC): concept of the method and preliminary experiment,” Precision Engineering, Vol.11, No.1, pp. 9-14, 1989. Y. Uda, T. Kohno, and T. Yazawa, “In-process measurement and a workpiece-referred form accuracy control system (WORFAC): application to cylindrical turning using an ordinary lathe,” Precision Engineering, Vol.18, No.1, pp. 50-55, 1996. T. Saiki, M. Tsutsumi, H. Suzuki, M. Kouya, and M. Ushio, “Development ofMeasurement for Motion Accuracy of 5 Axis NC Machine Tool,” Int. J. of Automation Technology, Vol.2, No.2, pp. 111-118, 2008. E. Trapet, J.-J. Aguilar Martín, J.-A. Yagu, H. Spaan, V. Zelený, “Self-centering probes with parallel kinematics to verify machinetools,” Precision Engineering, Vol.30, pp. 165-179, 2006. W. Gao, M. Tano, T. Araki, S. Kiyono, and C. H. Park, “Measurement and compensation of error motions of a diamond turning machine,” Precision Engineering, Vol.31, pp. 310-316, 2007. T. Nomura, K. Yoshikawa, H. Tashiro, K. Takeuchi, N. Ozawa, Y. Okazaki, M. Suzuki, F. Kobayashi, and M. Usuki, “On machine shape measurement of workpiece surface with Fizeau interferometer,” Precision Engineering, Vol.14, No.3, pp. 155-159, 1992. T. Nomura, H. Miyashiro, K. Kamiya, K. Yoshikawa, H. Tashiro, M. Suzuki, M. Usuki, and F. Kobayashi, “Shape measurement of workpiece surface with zone-plate interferometer during machine running,” Precision Engineering, Vol.15, No.2, pp. 86-92, 1993. T. Nomura, K. Kamiya, H. Miyashiro, S. Okuda, H. Tashiro, and K. Yoshikawa, “Shape measurement of mirror surfaces with a lateral-shearing interferometer during machine running,” Precision Engineering, Vol.22, No.4, pp. 185-189, 1998. T. Kohno, T. Yazawa, D. Saito, and S. Kohno, “Figure error control for diamond turning by in-process measurement,” Precision Engineering, Vol.29, pp. 391-395, 2005. C. P. Keferstein, D. Honegger, H. Thurnherr, B. Gschwend, A. L. Cooke1, “Process monitoring in non-circular grinding with optical sensor,” Annals of the CIRP, Vol.57, No.1, pp. 533-536, 2008. K. Furutani, K. Iwamoto, H. Takezawa, and N. Mohri, “Multiple degrees-of-freedom arm with passive joints for on-the-machine measurement system by calibrating with geometric solids,” Precision Engineering, Vol.23, pp. 113-125, 1999. A. Graziano, T. L. Schmitz, “Sensor design and evaluation for onmachine probing of extruded tool joints,” Precision Engineering, Vol.35, pp. 525-535, 2011. Y.Zi-qiang, L. Sheng-yi, “Exact straightness reconstruction for onmachine measuring precision workpiece,” Precision Engineering, Vol.29, pp. 456-466, 2005. Y. Zi-qiang, L. Sheng-yi, “High accuracy error separation technique for on-machine measuring straightness,” Precision Engineering, Vol.30, pp. 192-200, 2006. W. Gao, M. Tano, S. Sato, and S. Kiyono, “On-machine measurement of a cylindrical surface with sinusoidal micro-structures by an optical slope sensor,” Precision Engineering, Vol.30, pp. 274-279, 2006. H. Sawano, M. Takahashi, H. Yoshioka, H. Shinno, and K. Mitsui, “On-Machine Optical Surface Profile Measuring System for Nano-Machining,” Int. J. of Automation Technology, Vol.5, No.3, pp. 369-376, 2011. Y. Quinsat and C. Tournier, “In situ non-contact measurements of surface roughness,” Precision Engineering, Vol.36, pp. 97-103, 2012. X. Jiang, “In situ real-time measurement for micro-structured surfaces,” Annals of the CIRP, Vol.60, No.1, pp. 563-566, 2011. A. Taguchi, T. Miyoshi, Y. Takaya, and S. Takahashi, “Optical 3D profilometer for in-process measurement of microsurface based on phase retrieval technique,” Precision Engineering, Vol.28, pp. 152-163, 2004. T. Asai, S. Ferdous, Y. Arai, Y. Yang, and W. Gao, “On-Machine Measurement of Tool Cutting Edge Profiles,” Int. J. of Automation Technology, Vol.3, No.4, pp. 408-414, 2009. K. Furutani, N. T. Hieu, N. Ohguro, and T. Nakamura, “Automatic compensation for grinding wheel wear by pressure based in-process measurement in wet grinding,” Precision Engineering, Vol.27, pp. 9-13, 2003. A. Matsubara and S. Ibaraki, “Monitoring and Control of Cutting Forces in Machining Processes: A Review,” Int. J. of Automation Technology, Vol.3, No.4, pp. 445-456, 2009. E. R. Marsha, A. W. Moerleina, T. R. S. Deakynea, and M. J. VanDoren, “In-process measurement of form error and force in cylindrical-plunge grinding,” Precision Engineering, Vol.32, pp. 348-352, 2008. H. Yoshioka, M. Hayashi, and H. Shinno, “Status Monitoring of Ultraprecision Machining Using Micro Thermo Sensor and AE Sensor,” Int. J. of Automation Technology, Vol.3, No.4, pp. 422-427, 2009. M. A. Davies, T. Ueda, R. M’Saoubi, B.Mullany, and A. L. Cooke1, “On The Measurement of Temperature in Material Removal Processes,” Annals of the CIRP, Vol.56, No.2, pp. 581-604, 2007. D. Stoebener1 and M. Dijkman, “An Ultrasound In-Process-Measuring System to Ensure a Minimum Roundness Deviation for Rings During Turning,” Annals of the CIRP, Vol.56, No.1, pp. 513-516, 2007. E. Manske, G. Jager, and T. Hausotte, “Combination of multi sensor technology and multiple measurement strategies in micro- and nanometrology,” Proc. of the 10th Int. Symp. on Measurement and Quality Control, pp. D6-075-1, 2010. P. Yanga, T. Takamura, S. Takahashi, K. Takamasua, O. Sato, S. Osawa, and T. Takatsuji, “Multi-probe scanning system comprising three laser interferometers and one autocollimator for measuring flat bar mirror profile with nanometer accuracy,” Precision Engineering, Vol.35, pp. 686-692, 2011. A. Weckenmann, “The role of metrology in the exchange of goods and in the development of manufacturing technologies,” Proc. of the 10th Int. Symp. on Measurement and Quality Control, pp. 1-4, 2010.